A flat hierarchy, expert knowledge in the electronics PCB assembly business, state-of-the-art technologies and traditional values such as honesty, constancy and reliability characterize our medium-sized business. Alfa Electronics is your partner for electronic manufacturing services. With 3 locations in Pune Maharashtra India, we provide development and prototyping, SMT & THT assembly, cable & device assembly, materials management, and logistics in a streamlined supply chain. From ideation to assembly to delivery, we pride ourselves on providing customized, full-service offerings to our clients. Alfa Team have proven themselves in practice for more than eleven years of outstanding development and highest demands, way beyond the strict adherence to technical guidelines, are the ingredients for the absolute reliability our electronics PCB assemblies, even in extreme conditions. Our motivated and excellent trained team develops and manufactures innovative and exceptional quality SMT & THT assemblies and customer specific electronic products. Comprehensive tests in our in-house test field guarantee you faultless function of our systems within the whole cycle. The quality management systems ISO 9001 support us in our daily endeavour to improve processes and operations. That?-=s way we are able to remain competitively in our business. State-of-the-art technology coupled with a flexible, specialised workforce guarantees you high quality, reduced production times and therefore low costs. 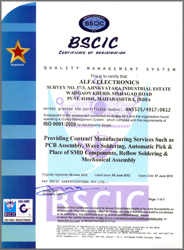 You can trust us, the specialist for SMT & THT assembly. Purchasing of soldering paste stencils, PCBs and other components with mutual commercial understanding. Short delivery times, if requested within 24 h with mutual commercial understanding. All our factories are certified according to DIN ISO-9001: 2008. Our operational and production processes comply with these important industry and safety standards. We also comply with European Union RoHS standards. For customers in all the fields, we maintain standard processes for non-RoHS & ROHS manufacturing. Having the option of manufacturing in both RoHS and non-RoHS settings gives us the flexibility to service the widest range of industries. In the electronics industry, accuracy and reliability are everything. Our fully-automated organizational system manages tens of thousands of individual components and ensures that each piece is assembled accurately. Over the years, we have developed extensive in-house quality assurance testing protocols that are carried out after each stage of the production process. At your request, we can also perform AOI tests, BGA inspections, high-voltage and function tests by outsourcing it. Our involvement in all types of industries have also given us experience in adapting our manufacturing processes to comply with the demands of individual project or industry-specific quality standards. Depending on your project or industry, we will meet and exceed the quality-specifications you require. As an experienced supplier for all industry, you can be assured that our quality-control standards conform to the most rigorous of industry specifications. Frequent customer and company audits verify our uncompromising commitment to quality here at Alfa Electronics. Our understanding of quality is not limited to the successful delivery of finished products. It extends to the fulfillment of our customer's current requirements and the anticipation of their future needs. In addition to our production and quality-management processes, we also see reliability and timely delivery as key components of our overall quality strategy at Alfa. 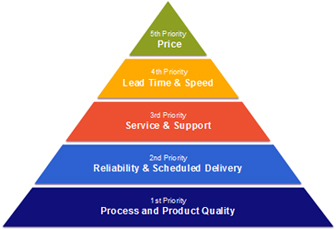 Our focus on personalized customer service and support lead to speedy quotation processing and short delivery times. Efficient and effective processes make it possible for us to offer our customers not only quality products and a high level of personalized service, but also attractive pricing. Pune – 411041 Maharashtra, India. S.No. 75/9, Raikar Mala, Dhayari Gaon, Pune - 411 041, Maharashtra, India. For customers requiring the highest standards above and beyond those established by IPC-A-610 Class 3, we have defined our own production standards, "3+", which include even stricter acceptance criteria. Get to know everything about our services, visit us at the respective exhibitions and events. We are looking forward to meeting you!